Brian McGinnis. of Counsel, Barnes & Thornberg, Intellectual Property Dept. The meeting will be held January 16, 2013 at 7:00pm in the conference room of ESCO Communications’ Indianapolis office. To ensure an accurate count for the meeting, please RSVP below. Date: January 16, 2013 at 7:00pm. 8940 Vincennes Circle, Indianapolis, IN 46268 (map). To stay up to date on section activities, be sure to follow us on Facebook or Twitter, and feel free to contact any member of the executive board to let us know your thoughts about the section. The Central Indiana Section of the Audio Engineering Society is pleased to announce the following Executive Board and Committee for 2012 – 2014 following a very successful election. The Section has enjoyed a record amount of growth over the past two years and looks forward to serving its members and the audio community in the years to come. Remember, to stay up to date on section activities, be sure to follow us on Facebook or Twitter, and feel free to contact any member of the executive board to let us know your thoughts about the section. The Central Indiana Section of the Audio Engineering Society recently held its first summer meeting on June 26, 2012 with a near-record attendance of almost 30 members! The first part of the meeting featured dinner hosted at Shapiro’s Deli courtesy of the Section for members which was certainly a hit with everyone in attendance, followed by a tour of Lucas Oil Stadium. That’s right, dinner and a tour! The tour was courtesy of the Lucas Oil Stadium Sound & Lighting Department’s very own Floyd Paulsen with assistance from systems integrator and friend of the Central Indiana Section ESCO Communications. Click the rack of amplifiers to view more pictures! Floyd took the section on a compressive tour of the stadium, including the field level where he discussed the complex system of speaker arrays and delays in the bowl, one of the amazing amplifier rack rooms, the press box, and the video and audio production suites. Along the way the section also received demonstrations of the Media Matrix and Crown Hi-Q operating systems which were in use throughout the installation. The meeting was absolutely a must-attend for anyone interested in live production and installed sound and we are very thankful to Floyd, Lucas Oil Stadium Sound & Lighting, and ESCO Communications for their generosity and support of the section. Those interested can find a digital version of the handout distributed at the meeting here on ESCO Communications website. Yes, it’s that time again! We’ve had two amazing years together as an executive board and need to change-up our Section leadership as required by our bylaws. Please remember you must be a full-member to vote, but can be nominated as an associate member and we can likely sponsor your membership if you are interested in Section leadership. As always, if you have questions please do not hesitate to contact us. The Central Indiana Section of the Audio Engineering Society is pleased to announce its first summer meeting to be held June 26, 2012. The first part of the meeting will feature dinner hosted at Shapiro’s Deli, followed by a tour of Lucas Oil Stadium. That’s right, dinner and a tour! For AES members the meal is completely free, so be certain to come out and break bread with your fellow members. Guests are welcome too (please invite as many as you like! ), and can join us for a donation of only $10! For dinner we will meet at the Shapiro’s Downtown at 5:30pm (see below for complete details). 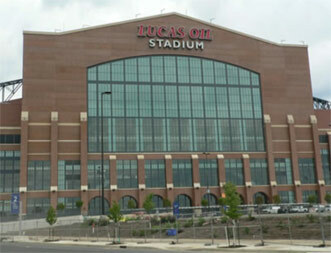 The tour is courtesy of Lucas Oil Stadium’s tremendously gracious Sound & Lighting Department. We will meet at the NW corner of the building which is the employee entrance and parking will be on your own (come to dinner and we can carpool!). The tour will take approximately two hours and will cover speaker arrays and delays in the bowl, the main amp rack room, Media Matrix and Crown Hi-Q operating systems, and other highlights. As always, they’ll be open to suggestions and if you have other interests they’ll do their best fit them in. The meeting is a must-attend for anyone interested in live production and installed sound. However, we encourage all our members to come out and attend our AES dinner so we can celebrate the successes of the past year together. To ensure an accurate count for the meeting, you must RSVP below. 808 S Meridian St. Indianapolis, IN 46225 (map). 500 South Capitol Avenue. Indianapolis, IN 46225 (primary address) (map). 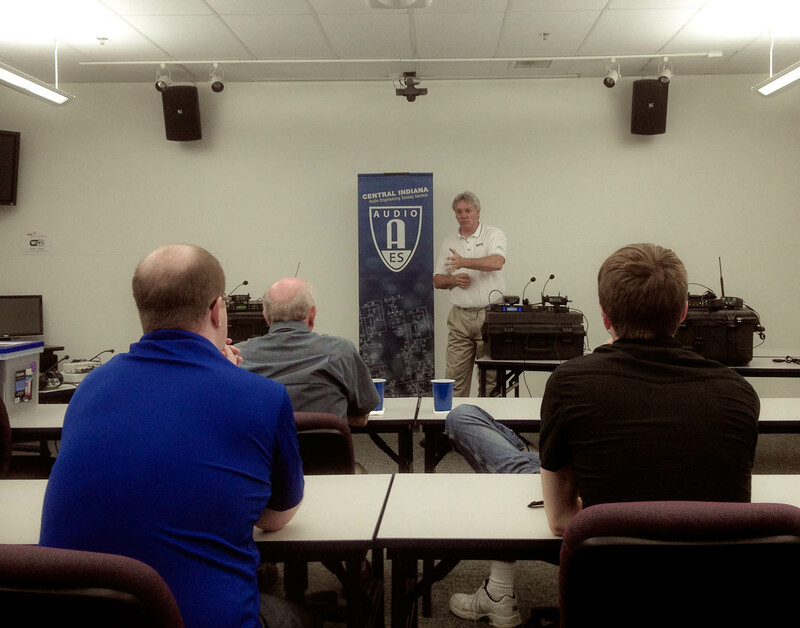 The Central Indiana Section of the Audio Engineering Society was pleased to host its Spring meeting on May 23, 2012 on the topic of Advanced Intercom Systems for Live Sound, Broadcast, & Recording Environments. The meeting featured Steve Quillin and Michael Brown of Bosch Communications Systems, presenting on the new lines of Production Intercom systems from Telex and RTS. This included the Digital Matrix, Partyline systems, and BTR wireless units. An excited audience gathered to learn not just of the latest advancements within the Telex and RTS lines, but also on intercom use and installation best practices with regard to frequency coordination and much more. The meeting was held May 23, 2012 at 7:00pm in the conference room of ESCO Communications’ Indianapolis office. The Central Indiana Section of the Audio Engineering Society is pleased to announce a joint meeting to be held May 23, 2012 with SBE Chapter #25 on the topic of Advanced Intercom Systems for Live Sound, Broadcast, & Recording Environments. The meeting will feature Steve Quillin and Michael Brown of Bosch Communications Systems, presenting on the new lines of Production Intercom systems from Telex and RTS. This will include the Digital Matrix, Partyline systems, and BTR wireless units. We are especially excited about this meeting as it represents an ongoing effort to partner with other professional organizations within the region. The meeting is a must-attend for anyone who works in live production environments, including live sound, recording, and broadcast. At our May meeting, we will also formally announce our elections for the year, the nominations and elections which will take place online. All interested in local AES leadership and involvement are encouraged to attend! The meeting will be held May 23, 2012 at 7:00pm in the conference room of ESCO Communications’ Indianapolis office. To ensure an accurate count for the meeting, please RSVP below. Date: May 23, 2012 at 7:00pm. A special feature of his presentation will be the unveiling of phonautograms recorded exactly 152 years before, to the day, on April 18, 1860. These recordings remained mute for over one and a half centuries and have never before been heard in a public venue. 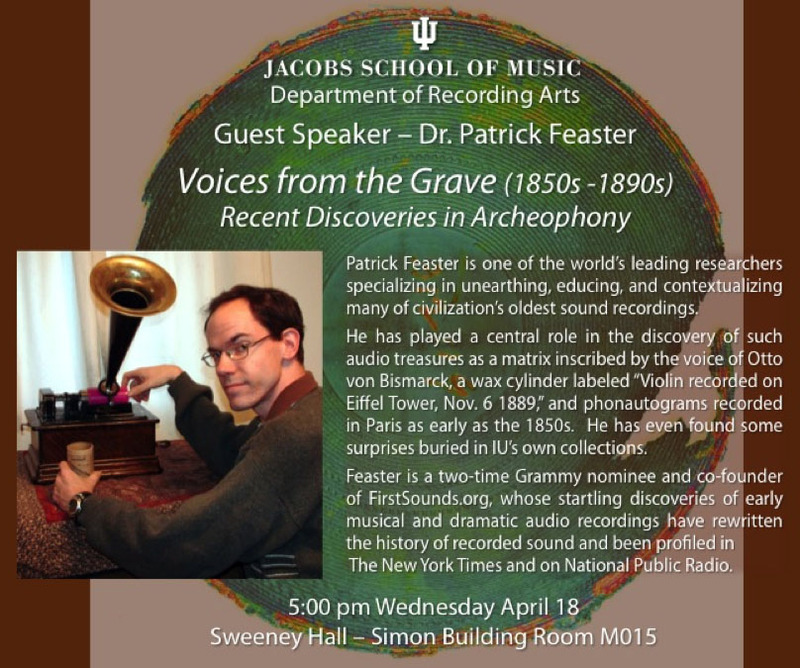 Two-time Grammy nominee Patrick Feaster is one of the world’s leading researchers specializing in the early history of recorded sound. His investigations have helped unearth dozens of significant, heretofore unknown historical artifacts containing aural information captured 120 to 160 years ago. He has also developed revolutionary methods to recover these ancient sounds and make them audible, in some cases for the first time since they were recorded in the nineteenth century. Newly identified wax cylinders recorded in Europe in the 1880s by William J. Hammer and Theo Wangemann, pioneering recording engineers who worked for Thomas Edison. Phonautograms created in Paris in the 1850s and 1860s by French inventor Édouard-Léon Scott de Martinville utilizing a stylus to etch patterns in soot-covered paper. The discovery these scientific artifacts and successful eduction of their audio content by Feaster and his colleagues at FirstSounds.org stunned scholars and forced the rewriting of the history of sound recording to acknowledge Scott, and not Edison, as the father of recorded sound. These revelations were profiled in The New York Times and on National Public Radio. Audio recovered from paper prints made in the late 19th century, inked from the surfaces of metal phonographic discs that have since been lost to history. Some of these prints were published in popular magazines of the era and Dr. Feaster has developed innovative techniques to educe the sounds contained on those discs from their printed images. Patrick Feaster’s rigorous research, technical ingenuity, passion for all things audio and sheer tenacity have combined to unlock a vast wealth of ancient human sonic expression – musical instruments, acting, singing, oration and more – captured well over a century in the past and at last, available again for all to hear, study and enjoy. The Central Indiana Section of the Audio Engineering Society hopes you’ve found this announcement useful. To stay up to date on section activities, be sure to follow us on Facebook or Twitter, and feel free to contact any member of the executive board to let us know your thoughts about the section. On March 10, 2012 the Central Indiana Section of the Audio Engineering Society hosted the first annual Central Indiana Audio Student Workshop. The event was hosted by Section Chair Kyle P. Snyder, as well as assistant workshop host Jeffrey Seitz and with great assistance from the Executive Board of the Central Indiana Section, in the Music Media Production and Industry studios on the campus of Ball State University. Kyle P. Snyder discussing workshop options with students at registration. Our pre-registration topped out at 180, and we saw physical attendance at 150 including numerous walk-in’s, reaching a group of audio students and professionals from every corner of the state and many from neighboring territories, who were appreciative beyond words. We couldn’t have been more pleased with how the event turned out.